KERALAM is truly, Kerala. It is your passage to the land, spurred on by remnants and memoirs-sometimes as simple as a piece of wood and sometimes as mysterious as a burial urn. Housed in a Heritage Building 'Park View Bungalow' -one that saw history in the making- KERALAM captures the quintessence of the land in an enchanting 7,000 sq. ft of space. Here, quaint hallways, majestic pillars and wooden staircases built in a mix of traditional and colonial style, will lead you across different time zones and spaces, to reveal the soul of Kerala. Keralam Museum of History & Heritage is Kerala State's First Thematic interactive museum .This Museum is a joint venture of Department of Tourism and Department of Cultural Affairs, Government of Kerala. 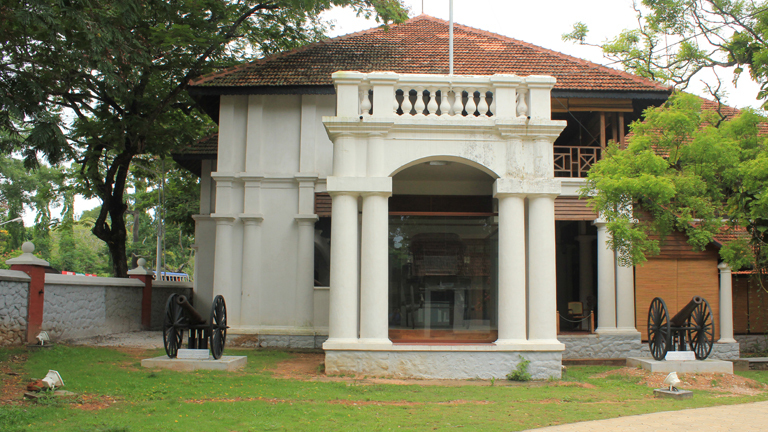 The museum is housed in a heritage building constructed for the residence of the Chief Secretary to Government of the erstwhile Princely State of Travancore. Based on theme of 'Kerala through ages' from pre-history to modern times, the museum has a wide range of objects that include bronze sculptures, ancient coins, murals, woodworks, stone implements, specimens from the Neolithic Age, burial accessories used in the Iron Age, and many other things that shed light into the cultural traditions, art, architecture, lifestyle, customs, and inheritance of Kerala. Narrative descriptions are provided for many objects to explain their background for interested viewers. Multimedia systems, touch-screen kiosks, and other aspects of modern technology are used in all the galleries to ensure and enhance visitors' comfort. Palm leaf manuscripts and Copper plate in Sanskrit and Malayalam. Traditional Kerala Nalukettu and Kitchen. Open on all days except on public holidays and Mondays.